I’ve reached another minor (but major to me) milestone. I now have a healthy 1600cc engine for my 1958 Alfa Giulietta Sprint. It is based upon a relatively precious AR00121*01312 block from a 1964 Sprint Speciale. This Alfa Romeo 1600 engine is now as good as it should be while the original is preserved on a pallet for posterity. Here’s how I did it. 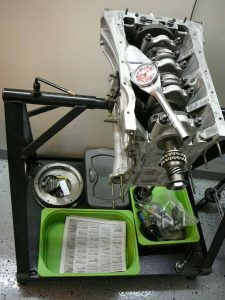 Unfortunately I started this replacement engine build for my 1958 Sprint “Normale” over ten years ago when my emphasis on building a super strong short block made more sense than now. But boosting the gusto of my Sprint with the next generation, and slightly larger capacity engine still makes sense. The older 750 version is more fragile, though the supply of most parts needed to rebuild that block and cylinder head has improved. Also the original tunnel case 4-speed transmission is much more difficult to rebuild than the later split-case design. My 1958 Spider Veloce had a handful of NOS synchro gears for the tunnel case in the glove compartment. Claus Mensel wanted them, I think, for the very rare low-nose Sprint Speciale he was restoring. So I decided the authenticity of Bertone’s coachwork of my basic Sprint should be respected for its pristine condition, but Alfa Romeo’s easily interchangeable mechanical elements could and should be upgraded because I want to use it a lot as a “driver.” Somehow it seemed pre-ordained. Claus needed my NOS parts and some money. He had just “killed” a 1964 Sprint Speciale, a project he decided had decomposed too much to restore. So I bought it’s mechanical organs for my Sprint. Win-win. I used to own a 1972 Alfa Romeo GTV and was lucky to also drive two 1967 GTVs, one in California. These were designed by Giorgetto Giugiaro right after he started out at Bertone’s factory [see interview with Nuccio Bertone], replacing Franco Scaglione. 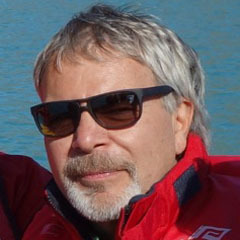 Larry Crane, art director of Automobile magazine at the time, brought his 1963 Giulia Sprint from California to Ann Arbor. I never saw one before in person. It was just like the one pictured next to mine in Figure 1. I loved the ambiance, feel and experience inside his 1600cc Sprint. I was smitten. 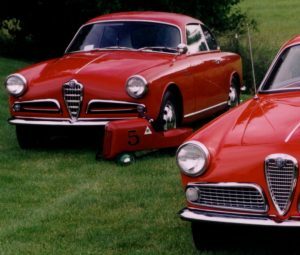 Scaglione, also designed the famous BAT series of aerodynamic studies on Alfa’s 1900 chassis, the Sprint Speciale derivative and the T33 Stradale, plus many more. There are more Porsche 356 Speedsters here than Sprints. Before the internet I began my searched for an “eyebrow” Sprint. The first was a mess. The second car that I bought is the one shown in Figure 1. Not visible are the many places the red paint had been polished through to the red oxide primer. Later this year I hope to finally finish this Sprint, not as a show car but as my favorite driver, a mild restomod that could have been built in the 1960s. Actually it is simply a 750/101 Alfa Romeo mash-up. Giulietta’s mechanical parts are preserved for posterity. My Sprint will have about 50/60 more hp/torque, an overdrive 5th gear, Girling disk brakes and those wonderful wide “alfin” drum brakes from the front now on the rear axle. I’ve also adapted seats from a 1967 GTV and a floor-mounted handbrake from a 2600 Alfa Romeo. Loss of momentum on projects costs a lot of extra time and mental resolve. But now I’ve reached a minor (but major to me) milestone. It literally sounds like I have a healthy 1600 cc Alfa Romeo engine for my 1958 Alfa Giulietta Sprint. This is how I built it with help from experts. Jim Steck, from Brookville OH, graciously cross drilled the block (long horizontal holes through the oil galley), as I observed, to supply direct oil feed to #2 and #4 main bearings. Two short vertical holes were drilled from each bearing support to intercept the horizontal holes. The original oil feed to those bearings was from one connecting rod journal each. Flow from there decreases as rpm goes up ─ not an ideal situation. I drilled holes in two upper shells, one each for #2 and #4 main bearings, to finish that direct source of oil. Moldex in Redford MI checked, polished, and cross drilled extra oil feeds in the crank so all the connecting rod journals are supplied by squirts from the main bearings on either side. Then they nitride heat-treated and balanced the crankshaft. I already drilled out the tapered aluminum oil passage plugs, then threaded the crank for pipe plugs and tear-drop chamfered the oil holes in all the crank journals to optimize flow. That work requires experienced eyes, ears, hands and wrists. Having a couple of extra taps and a broken tap extractor on hand is a good idea. Installing the crankshaft using dry and less desirable main bearing shells, then turning it while torquing down the mains, proved that the bearing supports in the block no longer lined up perfectly. Burnished reference marks on the shells showed the direction of misalignment. This must be part of the story why the valuable donor car was allowed to rust into the dirt. Auto Parts Machine and Services of Ann Arbor align honed the five main bearing supports for me with reference to the deck of the short block. I measured every bearing with micrometers and a bore gauge, trial fitted, and checked each with PlastiGage. Finally I got all clearances on the main bearing shells to be slightly on the loose half of specification — my goal was to build a “bullet proof” Veloce 1600 short block as shown in Figure 3. The “water jacket” at the bottom of each cylinder is sealed with a thin large O ring. The aluminum mating surface in the bottom of the block for these O rings must be clean and free of corrosion. 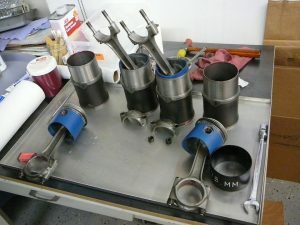 The piston and connecting rod assembly are then inserted, without caps, then this assembly goes into the block. The bolts are temporarily held by short lengths of rubber hose, then guided into place on the crankshaft. Figure 4 shows that the caps just got Loctite and then were torqued to specification. 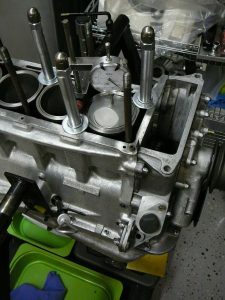 Always verify that the little end of the connecting rod is riding near the middle of the exposed wrist pin, and rotate a little frequently to search for changes in drag each time you torque down a bearing. In Figure 2, you will notice that I had my OEM/low mileage Veloce piston skirts coated with anti-scuff stuff and the crowns were ceramic coated. A used piston is good if it measures slightly larger in diameter parallel to the wrist pin, its ring lands are still snug, and wrist-pin bores are like new. 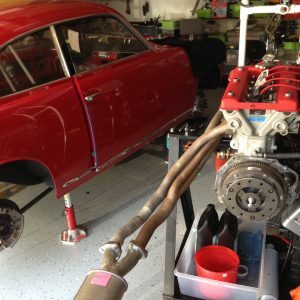 Not obvious is Precision Products in North Carolina fitted 15 percent lighter tapered-hole wrist pins and I fitted new OEM rod journal bolts with modern and lighter OEM nuts on resized OEM Veloce connecting rods. I sent new cylinders to Bore Tech Engineering, Cincinnati OH, for their Carbide Bore process which promotes rapid ring seating and longevity. This was technology transfered from motorcycle racing. My goal was to do better than 95 percent on a leak-down test. I gapped the rings and then balanced the piston assemblies and connecting rods to +/- one gram. I also fitted a lighter Giulietta flywheel with competition grade bolts and a new ring gear. A somewhat rare Bosch starter is fitted with the solenoid properly located to clear the throttle linkage for the Webers. The cylinder head was rebuilt a decade ago by Mike Sperry in San Francisco, ported to his Stage 4 specification and finished with his trademarked “radius’ed” seats. I paid particular attention to eliminating edges which can cause turbulence at the joint between the head and intake manifold. I found the holes for the studs allowed some misalignment so I drilled 1/16 inch holes to insert two temporary alignment pins. The same care was taken with the gasket. I installed new cam followers in bores notched for radical valve lift but for now I fitted a 10.9 mm lift Colombo and Bariani SM2 cam for intake, and Centerline’s 10.5 lift Euro+ cam on the exhaust side. Years ago, I had excellent results mixing up cams on my motorcycle engine. I learned that games played with exhaust lift and timing, without redesign and testing of the exhaust system, is not productive. However, more radical specifications on the exhaust side can produce a lot more horsepower, if drivability and even higher rpm are less important. 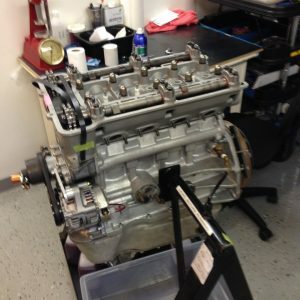 My goal was to start with a healthy 1600 “Stradale” engine with enhanced driveability and durability. I used a head gasket made by Reinz and square section O-rings from Chevy valve stem seals. I also used brass substitutes for the split dowel pins. These are machined to leave a flange, where it sits in the head gasket, in order to connect the oil supply passages from the main oil galley to the cam journals — a common source of seeps. I completely disassembled, cleaned the casting (in my ultrasonic cleaner), and re-gasketed my DCOE 40 Webers. The leather seals for the ball bearings on the throttle shafts were soaked in ATF to maintain a good seal. I borrowed an OEM 1750 distributor (much improved over the older design) from Joe Benson, and attached the original tube headers with one OEM-style resonator for my first start of the engine. I had packed the oil pump with petroleum jelly and filled the oil filter with oil. Cranking the engine without the spark plugs quickly showed 20 psi on the mechanical oil pressure gauge. I’m using Amsoil 30W break-in and Redline assembly lube. After a couple of hours of operation driving my Sprint, under varying load and rpm conditions, I’ll change to a high ZDDP 15w40 oil. Then after 10 hours I’ll take a sample and have it analyzed. On its first brief runs without load the exhaust temperatures were even except #1 was about 10% cooler or richer. The temperature could have been higher on the front side of the pipe. I’ll look at that spark plug to see what it has to say. The Webers have vintage after market air horns attached. I have to wait until this engine is installed to design and fabricate a filter box with a cold air supply. I have about five minutes running time on it, first without coolant to check for oil leaks, then with coolant, and finally with a regulated low-pressure fuel pump instead of gravity feed supplying the Webers. In the 20-second video below, I am test running it and comparing exhaust temperatures. The gauge was pegged at 60 psi. I discovered a couple of minor oil and coolant seeps at two pipe plugs. One was from cross drilling the block and the other was in the external coolant manifold with the thermostat. There was also a weeping trickle of coolant at the left rear corner of the head gasket (re-torquing the warm cylinder head fixed that seep). I am very happy with my first impression — it feels silky, sounds frisky, and is very responsive to the throttle. All photos by Peter Pleitner and video by Conrad Zumhagen.